After nearly a decade of training Grand Prix dressage horses in California, Sabine Schut-Kery has more invested than most in the success of the Adequan West Coast Dressage Festival, a CDI series that debuted in Temecula, California, last year. When a family emergency in her native Germany prevented her from attending the first two events this winter, she wanted to find another way to contribute. Ball’s idea was simple. In lieu of attending the entire series, Schut-Kery could sponsor another rider by paying their show bill up to a certain amount, which she set at $1,000. But Schut-Kery didn’t know where to begin looking for candidates. She brought it up with her local feed store manager, who immediately suggested she put a call out on social media. So she jotted out a Facebook post inviting riders to email her with a few paragraphs describing their background, goals, and why they believed they deserved a spot at the festival. She expected a handful of applicants. Within a few days, the post had nearly 200 shares, and her inbox was rapidly filling up. “It was really amazing to read through the applications I got,” Schut-Kery said. “I felt so touched by all the stories of people’s individual struggles, and by how much getting to a show of that caliber means to us as riders. It made me remember where I have been, and what a luxury it is that right now I can afford these shows. Not everybody can do that. “And, of course, I thought, ‘Wow! What am I supposed to do with all this?’ ” she concluded with a laugh. As she sorted through the emails, Schut-Kery felt drawn in different directions. She empathized with stories of personal hardship and loss that would make an experience like the AWCDF especially meaningful. But she also felt for the many amateur riders who applied, believing that their commitment to the sport is what keeps it all going. Ultimately, however, a third group won out: the young, up-and-coming professionals still fighting for a foothold in the sport. None impressed her more than Blair Niemcziek-Emery, a 28-year-old Air Force wife who supports her growing training business by working the graveyard shift as a vet tech at a small animal emergency clinic. Niemcziek-Emery saw Schut-Kery’s post on Facebook, and as she was just off the night shift, she initially scrolled past it. But upon reflection she decided an email wouldn’t cost her much. She quickly jotted something down and hit send before heading to the barn for a few hours and then going to bed. Certain she’d be lost in the flood of applicants, she promptly forgot about it. Niemcziek-Emery grew up on her parents’ cattle farm in Raymond, Washington, riding “like a wild banshee” and competing in western gaming events. Her parents divorced before she turned 10, and she and her mom moved to the Seattle suburbs, where at 13 she began riding dressage. 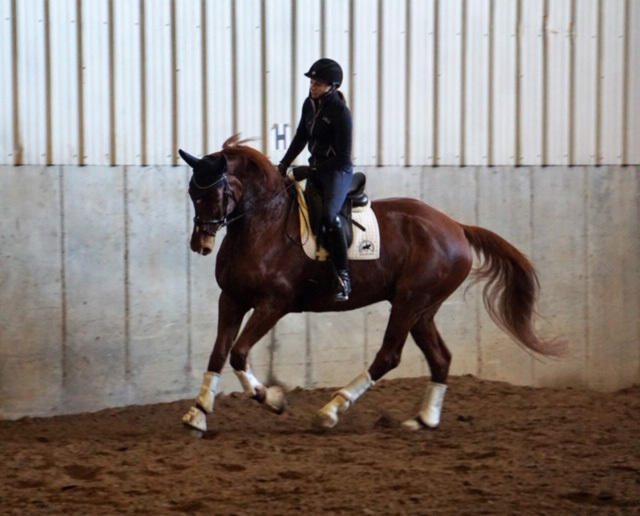 She got her first warmblood when she turned 15, a 17.3-hand Danish Warmblood named Ravel. Ravel’s antics did little to dampen Niemcziek-Emery’s passion for dressage. After high school, she went straight into a full-time working student position for Shaun Myers. After a year, Niemcziek-Emery accepted a position as assistant trainer at Sylvan Farm, a breeding and training facility in Arlington, Washington, owned by Judy Hedreen. There she spent four years learning to start young horses, from birthing and backing to training up the levels. All the while, Niemcziek-Emery continued developing Ravel. In her last year of young rider eligibility, she brought him out at Intermediaire I and Prix St. Georges, where he fell .8 percentage points short of qualifying for the program. A string of disappointments followed that missed opportunity. The next year, Sylvan Farms closed its doors, leaving Niemcziek-Emery without a job and, because it had been primarily a breeding operation, without many clients. She attended EMT training and fire school at Everett Community College and got a job as a part-time firefighter to keep herself afloat. She taught lessons sporadically and kept a few horses in training, but over the course of two years her business dwindled to almost nothing. Still, she held on to hope. Not in herself, but in a blood bay filly named Romany, whom she purchased as a weanling from Sylvan Farm just before they closed. Niemcziek-Emery started “Romy” as a 3-year-old in the summer of 2014, then put her out to pasture to grow until the following year. That fall, she met and fell in love with Jesse Emery, an active duty Air Force serviceman at home visiting family. By October, she had moved everything she owned into a 12’x12′ storage unit and relocated to Hawaii to finish out Emery’s tour with him at Pearl Harbor. 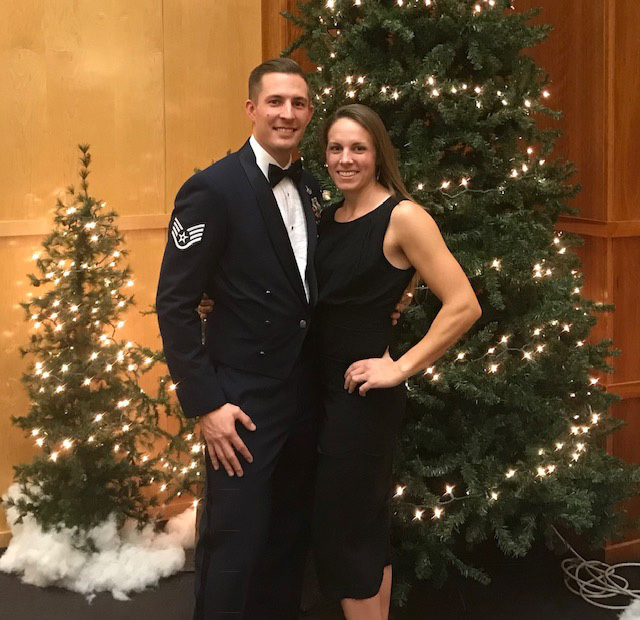 Emery got orders for Hill Air Force Base in December 2014, and the newly married couple moved to Layton, Utah, where Niemcziek-Emery had to start from scratch again, this time in a place where western riding dominates the equestrian scene. Yet her investment in Romy paid off. As they ventured out to more shows, the mare’s talent attracted exactly the kind of attention Niemcziek-Emery had hoped for years ago, and she started building a new client base. Today, she has a growing roster of students and about 10 horses in training at Heritage Ranch, the reining barn where she runs her business. At the fourth show of AWCDF, held April 10-14, Niemcziek-Emery will compete at fourth level on Romy, who has blossomed in the past 1 ½ years with help from trainers Patti Thurman and Michele Vaughn. She’ll also ride a third level test on one of her training horses, London—a 12-year-old Hanoverian gelding owned by her former boss and cowboy mentor, Boggs. “I am still in shock that this is coming to fruition, and I can’t thank Sabine enough for this incredibly generous sponsorship,” Niemcziek-Emery said. “I also have to thank my dad, for instilling an undying work ethic in me from a young age, and my mom, who never wavered in her support along my journey. And of course my husband. I joke that he’s my working student, because he comes out and feeds the nights when I’m working. I couldn’t do any of this without his support. Niemcziek-Emery hopes to gain exposure and experience at AWCDF that will prepare her for her first CDIs next year. In the meantime, she’s excited to bring more education to her lessons back home. All that sounds perfect to Schut-Kery, who wants to see the ripple effects of her self-described “tiny gift” spread as far as possible. 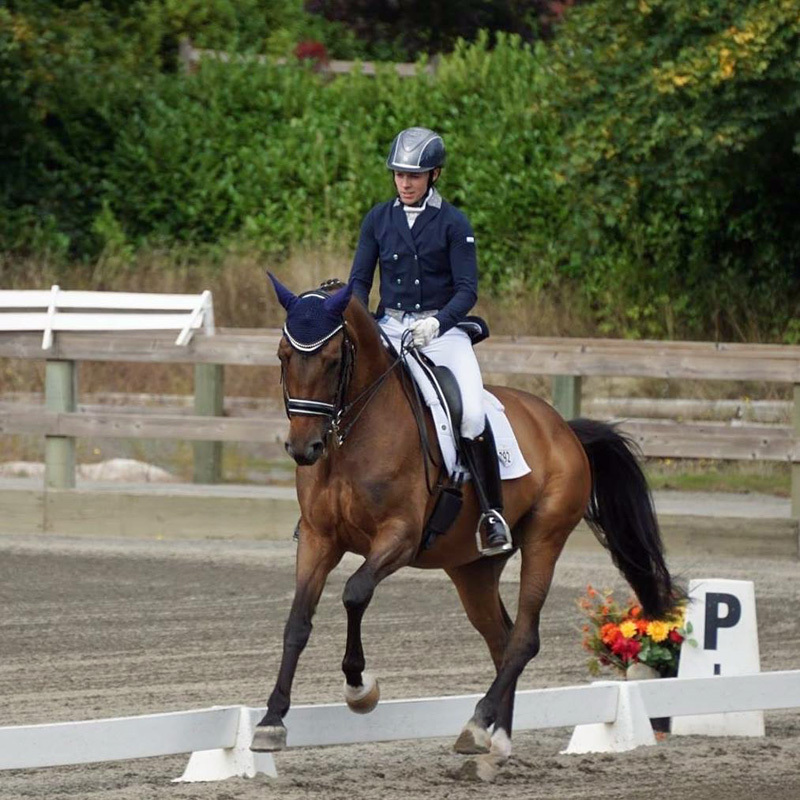 “I realize that my one sponsored rider is an incredibly small contribution to what it really takes to keep Scott Hayes’ AWCDF series going,” said Schut-Kery, who will stable with Niemcziek-Emery at AWCDF. “My hope now is that for some of us that don’t have huge amounts of money to contribute, maybe this could inspire someone the same way as Beth Ball inspired me.